It can be hard to give your dog the exercise and fresh air they require all the time, but exercise is essential for dogs to stay happy and healthy. Some days are super busy and you might not have the time to supervise your dog or play with them outside. That’s where an outdoor dog kennel comes in. Outdoor dog kennels are sturdy and tall, so dogs can’t escape easily. They’re also spacey. Finding the right dog kennel for your dog involves considering your dog’s size and where you’re going to put the kennel. If the kennel will be outside and exposed to the elements, you need to make sure that your dog will be protected. That means making sure there’s shade if your dog is out in the sun and that the dog kennel is well insulated or has a shelter inside if your dog is left outside in the cold. Lucky Dog Uptown Kennel is available in three different sizes. It comes with a heavy-duty waterproof cover with UV protection that attaches with sturdy elastic cords. The sturdy steel bars and wires are welded together before being coated to keep sharp pieces from hurting your dog. This also helps ensure that the kennel is properly protected from rust and corrosion. A few other features that make this kennel a great choice for dog owners are the sloped roof that keeps snow and water from building up on the roof and the 1.5” raised legs that make for easy cleaning. Despite its size this kennel is easy to set-up since the modular pieces are already pre-assembled. They just need to be tightened using hand tightening clamps. Owners love this dog kennel because of how easy it is to build, how sturdy it is, and how it keeps their dogs protected from the elements. Some owners have had their dogs bite through the wire though, so it might not be ideal for very destructive dogs. Aside from that, customers are mostly satisfied with the quality of this outdoor dog kennel and the reasonable price. ALEKO Dog Kennel is made with rust resistant galvanized steel and a heavy-duty one-inch frame. This kennel measures 5” x 5” x 4”, but owners can choose to connect more than one to create a larger space for bigger dogs. This kennel is relatively lightweight compared to others and is easy to put together. This indoor/outdoor kennel has one door that’s easy to open. This is a great option for owners that are looking for an affordable kennel. It even comes with a one-year warranty in case you run into any problems after receiving your dog’s kennel. Owners love this dog kennel because its high quality and their dogs love it! The only problem is that some owners find this kennel too short and it’s hard to find a cover for it that won’t get rain or snow piled-up on top. 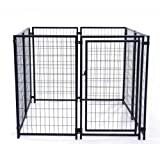 Most customers were very satisfied with this kennel’s price and the sturdy design. Lucky Dog Modular Kennel is made with a waterproof cover to protect dogs from sun, rain, and snow. 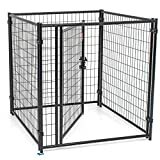 This kennel is available in three different sizes and is made with 100% commercial grade steel that’s welded to prevent any sharp edges from hurting your dog. In addition to a sturdy overall design, this kennel is elevated by one inch to make it easier to clean. 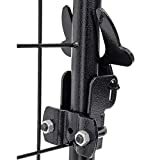 The panels come pre-assembled so it’s super easy for owners to put together and take apart if needed. A dog safe lockable latch makes it easy to keep your dog secured while you’re away while still giving them a chance to get some fresh air. According to satisfied customers this outside dog kennel is able to withstand even the toughest dogs. A few downsides to this kennel include instructions that might not be too clear and the fact that some owners may need to duck to get through the door for cleaning purposes. Many customers love this kennel though, saying that it’s one of the safest and most durable they have tried. Advantek Pet Gazebo is 60” x 60” x 60” and meant to contain dogs that weigh up to 100 pounds. This kennel is designed to be set up fast and easy without the use of any tools. It also features a safe and secure latching access window that makes it easy to interact with your dog without opening the door and letting them out. Included with the Advantek Pet Kennel is a reversible, weather resistant polyurethane cover that provides maximum protection from the elements. The roof of the kennel is sloped so that there’s no water or snow build-up. 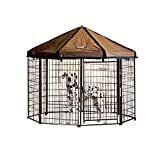 If you have more than one dog, these gazebos can be easily connected to create a larger space for your furry friends to play in. Customers say that this kennel is great and easy to set up, the only downside is that it takes a bit of time to do. This kennel is very secure and owners who travel say that they can confidently leave their dogs inside for a while without supervision. So, which Outdoor Dog Kennel Is Best for My Dog? Dog kennels are a great way to give your pet more time outside without having to worry about them escaping, meeting up with strange dogs, or running into traffic. The important things to consider are the size, safety, and durability of the kennel you are buying along with features that make it suitable for your weather conditions. If you’re going to buy a dog kennel you want to make sure you do your research first. If you order online and don’t get what you expected a large kennel can be a pain to send back. When you know what you’re buying ahead of time and you’re conscious of what other owners have said, your dog will be happy on the first try and so will you. » Check out all outdoor dog kennels available on Amazon.